I love Little House on the Prairie. In fact, I still have my very own collection of Little House books that I have been able to share with my children. And I can remember watching the TV show with my mom as we enjoyed Laura’s antics together. 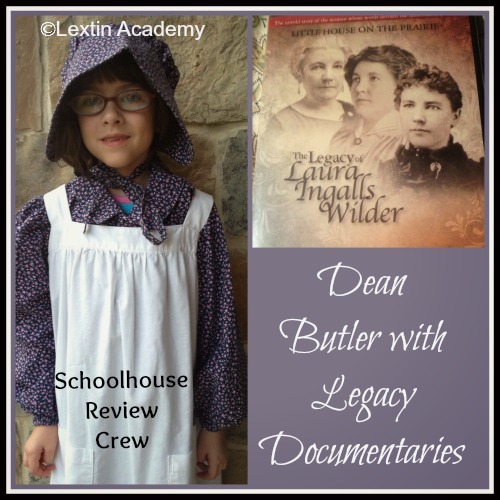 Because I have loved Little House for years, I was so excited to be able to review a documentary about Laura Ingalls Wilder produced by Dean Butler with Legacy Documentaries. Legacy Documentaries is a company dedicated to creating high-quality documentaries. The company has produced bonus footage for Little House on the Prairie as well as two documentaries about Little House – one about the life of Laura Ingalls Wilder and another documentary detailing the life of her husband Almanzo Wilder. Dean Butler is one of the executive producers of Legacy Documentaries. He portrayed Almanzo Wilder on the Little House TV Series. Because of his fascination with Little House on the Prairie, he researched the history of the books and of Laura and Almanzo’s life, leading him to produce two documentaries about them. This documentary includes information about Laura’s childhood and the background of the famous Little House on the Prairie books. The DVD takes you to historic locations associated with Laura’s life and includes still pictures from that time period. Also included are beautiful drawings of scenes from the books as well as reenactments of various scenes from many of the books. The documentary also has interviews with many experts on the books and they provide facts and tidbits about Laura’s life, the process of writing the books, and the difficulty in getting them published. There are also several bonus features included with the DVD. There is a director’s diary that follows Dean Butler’s journey of making the documentary, showing the various locations he visited, the people who participated in the reenactments, and the experts who contributed to the documentary. There is also a trailer for Dean Butler’s other documentary: Almanzo Wilder: Life Before Laura. In addition, there is a trailer for Pa’s Fiddle which is a concert based on the music that is described in the Little House books. The documentary is appropriate for an elementary aged child up to an adult. This DVD retails for $24.95. That it ended. Seriously. I wanted more Laura! I could have kept watching! I loved the actual pictures of Laura. Curly was amazed – she was a real person! The hand drawn pictures and reenactments added so much to the documentary. It was not just experts talking about Laura and her story – you were watching it happen. The reenactments were very well done and all the pictures were beautiful. I learned so much about Laura, her books, and her life. I never knew the details about Laura and her daughter and their complicated relationship. I learned what parts of the book were fact and what part were fiction. It was a wonderful inside look into the writing of the books that I have loved for years! The documentary takes you to Pepin, Wisconsin to show you where Laura actually lived. There are pictures of the museum there and the historical sites associated with Laura’s life. I loved being able to travel there via the documentary and experience the setting of the book. I loved this documentary. I have always loved Laura Ingalls Wilder and her Little House books but I didn’t know much of the history of her life and her family. I learned so much for the documentary and can’t wait to read the books again with a new perspective on Laura’s family and the hardships they endured. Curly watched bits and pieces of the documentary with me and was thrilled to see the actual pictures of Laura and her family. The books have now come alive for her and the characters seem all the more real. She has a new respect for the books and wants to read them again. This will be a documentary that we refer to often over the years as my kids grow and watch it with me. And yes, I will absolutely have to get the one about Almanzo now! His and Laura’s love story is so inspiring! Read other review from the Review Crew here!